Please enjoy the attached guide to learn more about the 14 default roles created in QuickBooks Enterprise 17.0. To maintain desired security and confidentiality of your data file, assign each user to their own username/password and discourage sharing passwords. Each user can be assigned to one or more roles as shown below, or you may create a custom role for a specific purpose. NOTE: “View-only” permissions will provide the user with view access to everything in the file – including banking and payroll data. Use this one sparingly! Another tip I have for you is regarding “full access” – this one never ceases to trip me up when I least expect it. Full access doesn’t allow that user the ability to view the insights page, create a closing date, launch advanced reporting or view the income tracker or bill tracker. If you want the user with “full access” to be able to do these things, you will need to create a new role, or edit the default permissions in the full access role under the Company radio button. 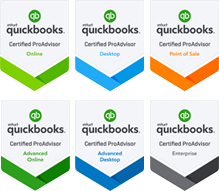 If you have any questions about implementing roles or any other aspect of QuickBooks security, please don’t hesitate to contact us.